Vladimirs is the second surprise Hells Headbangers has thrown my way this week. The surprise itself comes not from the fact The Late Hours is a cool listen, but because Hells Headbangers turned to something far from its more gruesome black-death palette to portray darkness. Vladimirs is supposedly a cult band from the early and mid-90s, but the one I have not heard about at all until now. My miss, no doubt. The Late Hours is their reunion mark, the band not having released a full-length album in a while. 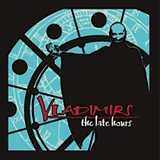 Just as the moniker itself and cover art implies, the subject of The Late Hours is vampire/dark arts inspired (I assume the common Eastern European name Vladimir is often associated with Vlad the Impaler, Count Dracula in the mind of others). Musically, the album is a rollicking trippy borderland between horror-punk and gothic rock, which makes it all delectably consumable. Without losing a catchy angle for a single moment, Vladimirs navigate through a dozen cuts ranging from punky B-horror low budget movie soundtrack (Zombie Eyed Youth) to a dirty, sleaze rock (Last Song for the Lost) to gothic realm but with a more definitive gritty angle (New Flesh). Droning only for a song or two (Quiet Room, City of the Living Dead), Vladimirs manage to come up with some things supermelodic (Synthetic Happiness), or having a longing, sad edge to them (aptly titled Where to Run?). Most of the time The Late Hours is up tempo and overflowing with energy, until it hits the closing 13 min title track, which begins as a dark gothic ballad, meanders around, before picking up again in the riff department. Vladimirs have an unbelievable knack of taking those rollicking riffs and sculpting graveyard anthems around them, sounding a bit grotesque, but not cheap, in the process. While listening to The Late Hours you can’t get rid of a feeling that this is all a show, and eventually it will end, but the sheer realism of the “moving kaleidoscope” impresses. Strong in the guitar department, Vladimirs are made even more unique in their vocal approach. While the first notes from the vocalist mouth on Last Song for the Lost sound like Fernando Ribeiro (Moonspell), the voice tends to fluctuate between weepy and angry sides, creating an interesting effect. Cleaner approach towards the album’s end is just as welcome as hysterical chorus of City of the Living Dead. The promo makes reference that the fans of Devil’s Whorehouse and Samhain would love this, but I would also strongly recommend it to mid-era Sentenced fans. The deceased Finns must have felt close to Vladimirs mindset when they covered White Wedding on their Love and Death EP.